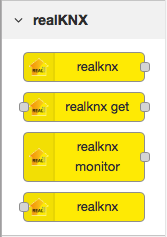 The latest addition to the realKNX feature list is the very powerful but yet easy-to-use visual programming tool Node-RED. Node-RED is used for building automation tasks, simply by ‘wiring together’ code blocks. It uses a visual programming approach that allows wiring together predefined code blocks (known as ‘nodes’) to perform a task. The connected nodes, usually a combination of input nodes, processing nodes and output nodes, when wired together, make up ‘flows’. This visual programming approach requires no programming skills. Our customers have access to an extensive code library. The library demonstrates low level functionality as logical functions (AND/OR etc), SMS & Push notifications to mobiles phones, HTTP requests. We will soon add high level functions as smart energy management modules as well as Feelgood light modules.